The lovely detached cottage is just a few metres from the harbour, adjacent to the beach, on the Harbour Road with upper views over the bay. The accommodation was originally the old net store but has been fully restored and modernised into a one bedroom house for self catering holidays and short breaks. Entrance is through our newly built porch, where you can hang coats jackets etc. The downstairs is open plan with kitchen and lounge. The kitchen has cooker, washing machine and other domestic appliances for your use. The lounge has a TV, DVD player, music centre and a selection of CDs, DVDs and books. There is a spiral stair leading to the upper floor. Upstairs there is a bedroom with double bed, a second TV and DVD player and bathroom off. A hairdryer is also provided. 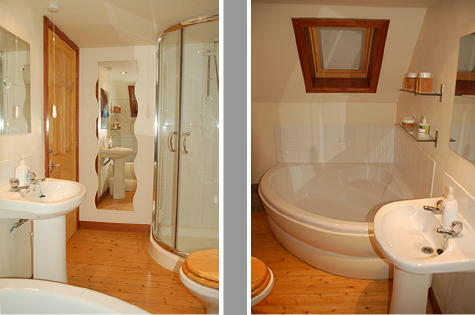 The bathroom has a corner bath and separate shower with wc and basin. Towels are provided. Heating is electric eco wall panel heaters. WIFI is available free of charge for those who need to keep in touch. A full size single self inflating airbed is available for a child or additional guest. There is a small additional charge for this. A travel cot and booster table seat can also be provided. There is no charge for this but guests are requested to bring their own bedding for the cot. Please let us know your requirements prior to booking. Well behaved pets are welcome - Free of charge! We had an amazing time at Harbour Cottage, it’s the perfect place to get away from it all and explore a truly beautiful part of Scotland. 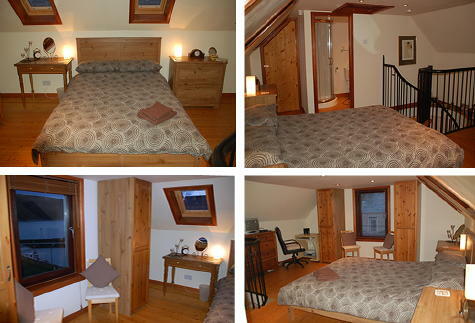 The cottage has everything you need and is very cosy and comfortable. It was spotlessly clean and feels like home as soon as you step inside. 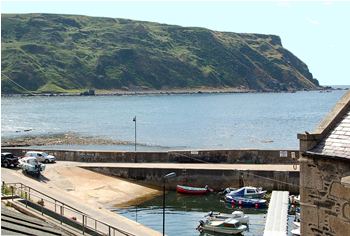 The location is great, right by the harbour and close to some lovely beaches. Close to the cottage is the fantastic Harbour Restaurant which is run by a very friendly and lovely couple who serve the most delicious food. Booking a table here is a must if you stay at the cottage. We also had a great time on New Year’s Eve in the local pub, The Garden Arms, everyone was very welcoming and friendly, lots of fun. We really couldn’t have asked for anything better, the owners of the cottage were helpful from start to finish and I can’t recommend staying here enough. Thanks for a wonderful stay, we hope to come back soon. Thank you so much for the use of your cosy cottage, its absolutely perfect for two people and so well equipped there is nothing more you could want. It must have been a real ‘project’ for you to start but it has been done beautifully. The weather wasn’t too bad so we could golf daily barring 2 days when it rained non-stop (its all the luck of the draw). Thank you once again and hopefully we will be in touch next year. 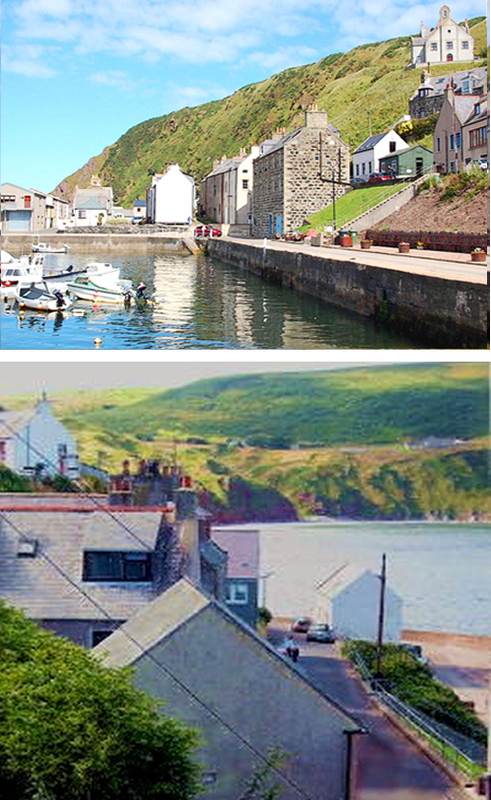 We absolutely fell in love with Gardenstown, & your cottage was a delight to stay in and the perfect location, right next to the harbour front. Every evening (as we were lucky enough to have the sunshine during our stay), hubby & myself grabbed a well deserved glass of wine, sat on the bench next to the harbour, & watched the kids crab fishing, usually til late! We enjoyed the most spectacular sunsets & found the whole holiday extremely relaxing. The kids loved watching the seals butsadly missed the dolphins by 4 days! I just wanted to say thank-you & we'll definitely visit again. I have just had a short break of two nights at Harbour Cottage and it was lovely. 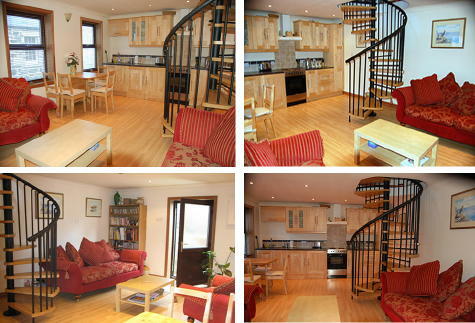 It is very close to the harbour and Seatown and the house is beautifully decorated and immaculately clean. It is very quiet too, so provides a nice stress free break. Sue gives you lots of information prior to coming and is very friendly to speak to. There is flat parking outside the house and safe turning at the harbour (the streets are narrow). I would highly recommend this cottage for a short or long break. Thank you Sue for making this a lovely experience. Forgot to say that there are lots of lovely touches in the cottage like products you can use if you need to, internet, tv's in lounge and bedroom and even games and books to use. "We arrived at the cottage yesterday, what a charming little cottage in a wonderful little place." "We had a lovely peaceful stay at Harbour Cottage and the weather wasn't too bad! We spent a lot of time watching the redsahnks on the beach, eating and generally doing nothing. Thank you very much for the opportunity to share your home." "Love the cottage and will definitely book again"
"Cottage was great. Very homely. Thank you. We hope to use you again"
"Cottage was lovely, alas the weather wasn't..
Never mind Gardenstown was as nice as ever along with everyone we met"
"Gardenstown and the cottage were lovely....the dogs loved the location too"